The kid was hurt by a shot from Bailey that went for a six. Cricket can be a dangerous game for everyone playing it as there is a possibility of getting hit by the ball anytime. Being hit by the ball has even proved to be life-threatening on the field. Cricket balls have also injured fans in the stands as the ball sails into the crowd far too often now and many times people try to catch it, even if it means diving across rows. However, most times the injured are to people who were at the wrong time at the wrong place. We got to see another unfortunate incident during the Hobart Hurricanes and Sydney Thunder match during BBL 2018-19. George Bailey had just hit a maximum which sailed into the stands and unfortunately, a young fan became a victim, as the ball hit him. The play for briefly stopped as the medical staff on the ground and even the players attended the young boy who was in tears. As a precautionary measure, the youngster was taken to a nearby hospital for scans, but fortunately, he escaped any serious injury. Talking about the match, Hurricanes posted 165/4 in 19 overs with Bailey top scoring with 53 in 35 balls. But this fell way short of expectations, as Usman Khawaja (36 off 21 balls), Callum Ferguson (47 off 34 balls) and Chris Green (34 not out off 28 balls) of Sydney Thunder helped their team reach the target within the stipulated overs with four balls to spare and won the game by four wickets via DLS method. For Hurricanes, wrist spinners Qais Ahmed and D’Arcy Short shined, as Ahmed picked 2/22 in his four overs, while Short picked two wickets for 27 runs. However, the total proved to be insufficient thanks to clever batting by Thunder’s batsmen. 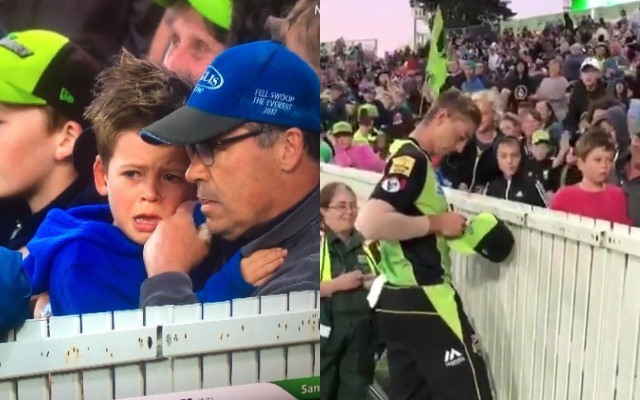 The young fan was visited by Thunder’s fast bowler Daniel Sams, who asked about his well-being and presented the fan with his cap, on which he signed. The kid also got George Bailey’s gloves from the match after the completion of the game. How good is this from Daniel Sams? Later the kid was pictured wearing the cap gifted by Daniel Sams and the gloves givens by George Bailey. BBL 2018-19, Match 25, Melbourne Stars vs Perth Scorchers, Match Prediction: Who will win the Match?